My iScone recipe (based on last year’s Rachel Allen Scones post but using a lot less butter substituting ricotta and yoghurt instead). Makes 6 – 8 scones. Preheat the oven to 220 C Gas Mark 7. Sieve the flour and bicarbonate of soda, cream of tartar and salt together into a large bowl. Rub the cold butter into the flour until you can’t feel it any more. Whisk the ricotta, yoghurt and ⅔ of the egg together. Save a bit of the egg to paint the tops of the scones before you put them in the oven. Add the ricotta mix to the main bowl and mix lightly together. If the dough doesn’t come together quickly then add a little more yoghurt. Once it has come together don’t worry about getting a super smooth dough. Take it out and pat it into one piece on a lightly floured board. I simply patted it out to a flat squarish shape, used a rolling pin to make sure it was roughly even and then cut it into eight pieces. That way there is no re-rolling or added squidging of the dough. Place on a floured tray. Brush the tops with a little egg and sprinkle with demerara sugar. Onto a rack to cool for a minute while you..
Find a tray and have a sit down and treat yourself to afternoon tea! Here served with home made apricot jam and creme fraiche. Yum! NB We like unsweet low fat scones because we figure that you fill them up with cream (or creme fraiche) and jam which makes them sweet and rich enough. If you are making scones with raisins in which you are going to eat just with butter then you might want to put more sugar in the mixture and these ones have so little fat and sugar in them that sometimes a very good dog can have a bit too. 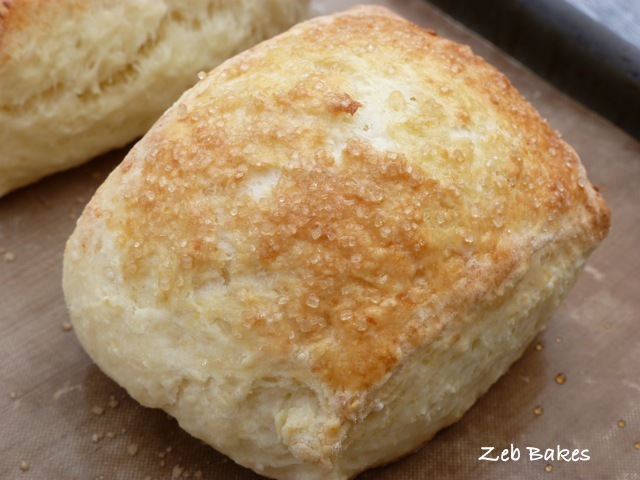 Don’t forget to check out the others’ fun posts – links in the other scone post here! This entry was posted in Recipes and tagged baking, home made ricotta and yoghurt, international scone week, low fat, low sugar on 10/08/2011 by Joanna. the new banner is awesome! Mmm! I like the puffy puffiness of these! They look as soft as feather pillows. Like I already said, Mmm! baked loveliness indeed. I made something similar from a Rachel Allen scone recipe as they had such little sugar in them. When I took them into work I was a little worried people might not like them but everyone said they preferred them and find other scones can be a bit sickly. Of course a lovely layer of jam is obligatory so they end up not being quite as virtuous as they first sound! We like these plainer scones too and yes they are indeed based on the Rachel Allen recipe in Bake though I have reduced the butter by replacing it with ricotta and yoghurt and only made half a batch. Another easy way to eat less, bake a smaller quantity in the first place! I don’t remember cakes being so sweet when I was a kid generally, but then our veggies have got sweeter too, carrots and apples and sweetcorn, all bred for extra sugar content. I am a big savoury fan and find it harder to reduce salt than sugar. Your scones look beautiful!! I’ll have to try these this winter, but it will have to be w/ store bought ricotta and yogurt. I made some cheddar & green onion ones last night to commemorate this international scone week, nothing too fancy, but tasty. Won’t be doing a post on them though, as I just can’t bring myself to do much right now. Don’t go out and buy it specially Mel. I was just experimenting, something I rarely do and I reckon any combination of buttermilk or yoghurt or cream will do the trick. You need something a little sour to react with the baking powder that’s all. At least I think that’s how it works with scones. But regular milk works fine with a little lemon juice or similar. Lovely looking scones and I bet ricotta works really well – I must get around to making some of my own. We have just made some kefir cheese though – I wonder how that would work …… hmmmm. I’d never made sweet scones until I made the chocolate ones and hadn’t realised that most people put sugar in theirs. I do quite like the idea of having a crunchy sugary top though. I am getting interested in the kefir thing all over again. Spiceandmore has been writing about it over on her blog. She has some great photos on there too! Do you have the milk sort or the water sort? You gave me a link to a huge site all about it, Dom’s Kefir? And I read lots and felt a bit swamped, but one day I would like to try it very much. Thanks for the link Joanna. It was interesting to hear how it helped to settle stomachs. Fermented foodstuffs are another one of CTs areas of expertise – I’m very much on the sidelines. He used to have an unusual seed company many years ago which also sold things like kefir grains, tempeh and miso cultures and all sorts of unusual things.